Beginnings are always exciting and fun. Whether it is the beginning of your school year, the beginning of our Kids Magazine or the beginning of the world, beginnings are EXCITING! The very first verse of the Bible talks about the greatest BEGINNING that ever happened. Genesis 1:1 tells us that God created the heavens and the earth. From the beginning of time, God has been thinking of us and planning for us. God created this world and God created YOU! From the beginning, God has loved you and he made you special and unique. God has been thinking about YOU from the beginning of the world – even before you were born! God has a plan and a purpose for your life. Isn’t it amazing to think that the creator of the entire universe is thinking about YOU! God loves you so much! 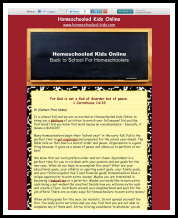 For many homeschoolers, September is the beginning of their “school year” and the perfect time to start fresh. If last year, you struggled with your studies or your relationship with your family, this year can be different! A good practice is to start each day by reading the Bible and praying to God. Ask God each morning to help you try your best and to be patient, kind and loving to your family. God has a plan for your life and believe it or not, it starts now Start asking God every single day to guide you and help you decide what you want to be when you grow up to be an adult. God made you unique and he gave you special gifts and talents. God wants you to use these gifts and talents and He will help guide you as you grow. God was thinking of ME from the BEGINNING of the world! God made me unique and special! God has a plan for MY LIFE! Today, I will read my Bible and pray to God for His help and guidance – Thank you God for loving me and for sending me your Son Jesus!